first time in India. 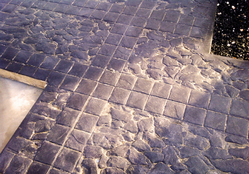 we have developed the premix for decorative concrete overlay. we can make stone effect in the plaster itself. no curing is required after plastering. The ultimate cover ups for plain, old or unsightly concrete.texure-crete and spray deck are textured overlay systems designed to transform ordinary concrete into bold and exciting textured surfaces. Keeping the diverse requirements of customers in mind, we are instrumental in providing Artevia Decorative Concrete. We are presenting an excellent quality assortment of Decorative Concrete Pillar.